What is a Foil Balloon? Foil balloons ( also called Mylar balloons) are made of a thin , continuous film of metal over nylon. 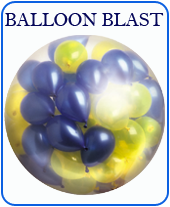 These balloons are less porous and remain inflated several times longer than latex balloons. You don’t need to knot these self-sealing foil balloons. Foil balloons can also be air-filled and when filled with Helium, they float. Note: Foil balloons do not expand like latex balloons and hence they burst if you overfill it. Foil balloon comes FLAT and UNINFLATED. Foil balloons must never be released outside as they do not bio-degrade and also they may conduct electricity. Do not expose foil balloons to extreme heat or they can burst.